A few things in life are inevitable – like parking spot shortages, nosey neighbors, and rising rent costs. In 1950 the median gross rent was $250. By 2000, it had risen to $602, according to the U.S. Census Bureau. In urban areas like Manhattan The New York Times says rent prices hit a much higher average – $3,418. That’s way more than most mortgages. Life as a renter may be easier, but not always cheaper. While we can’t do anything about your terrible parking space or your annoying neighbors, we can help you save on your rent. Here are 5 sneaky ways to lower your rent. 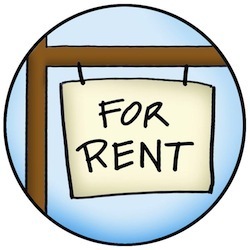 For a landlord, finding a new tenant is a pain. They have to place ads, do walk-throughs and screen applicants. Meanwhile, while the place sits vacant, they’re not making any money. You can leverage this knowledge to negotiate a lower rent price. For example, if your landlord asks for a six-month lease, offer to sign a year lease for a lower rent price. If the landlord wants a year lease, offer to sign on for two years. By signing a longer lease, you’re guaranteed a lower rent rate for a longer period of time and your landlord is guaranteed a tenant. It’s a win-win. Wonder how Manhattan landlords get away with charging $3,418 a month? They’ve got a spot in a prime location. In real estate, location drives housing prices so if you live in a big city, you’re going to pay more than people in nearby suburbs. It may not be ideal, but you can save a lot on rent by moving a few miles away. To get an idea of how much, check out sites like PadMapper and search nearby zip codes. If you’re handy with a set of tools and have some spare time, you might be able to negotiate a work-for-rent trade with your landlord. For example, my landlord has a fulltime maintenance worker on staff who lives in one of her apartments for half price. In exchange, he answers small maintenance requests from other tenants. Don’t know your way around a water heater or small appliance? You might be able to score another part time job from your landlord, like office management, designing a website, lawn care, or screening tenant calls. Even if it doesn’t pay your rent, you might be able to get a discount if you offer to go around and collect checks from other tenants. Renting isn’t just the cost of rent; you’ve also got electricity, water, Internet, cable and sometimes a rented parking space. Add all that up and you could be spending nearly twice as much as the amount listed for rent on the lease. However, some landlords include a few utilities or extras in their rentals, which can save you a ton of money. Be sure to compare the total cost for two or more rentals before signing a lease. For example, you see one apartment for $600 a month with nothing included. The next apartment is $680 a month but includes water, trash service and Internet. Which one is the better deal? In my area water and trash service costs about $55 a month and Internet runs about $45. That’s $100. Since you’d pay that yourself in the first place, rent costs would actually be $700, or $20 more than the second rental. Most renters assume the advertised rent price is what you’ll pay no matter what, but there is some wiggle room, especially with private landlords. If you’re renting a privately owned house or a spot in a small apartment complex, try to negotiate with the landlord. For example, you might mention that another nearby apartment complex is currently running a better special. You could also simply say that you want to sign the lease, but the rental is a bit out of your price range. Some landlords are willing to negotiate, some aren’t, but it doesn’t hurt to ask. After all, at worst, they say no. At best, you just scored yourself cheaper rent.